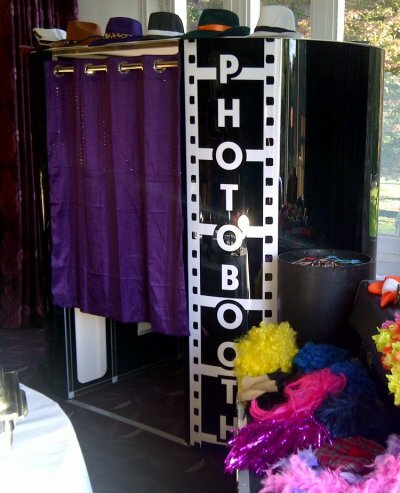 A photo booth is the must have item for any wedding reception. It creates fun momentos for both your wedding guests with the instantly printed photo and also the bride and groom who are given a CD containing digital copies of all the photographs taken in the photo booth so you can see exactly what your guests got up to! There's also the option of having the photo booth set to print a duplicate copy of each print so you can create your own album. 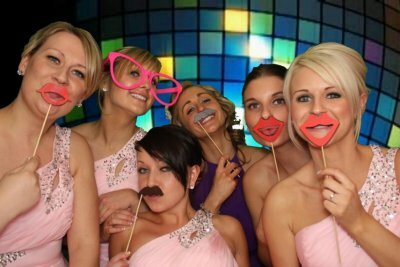 The photo booth is fully automated so although we'll have a uniformed member of staff on hand for the duration of the event to ensure the smooth running of the equipment your guests can relax and have fun in the privacy of the photobooth for some perfect pictures. Photos are taken in a series of four pictures all at the control of the guests following the easy on-screen instructions. Your guests may return time and time again for more pictures during the hire period as there's no limit on sittings within the time booked. A large basket of props containing hats, wigs, masks, comedy glasses, and picture frames is provided free of charge for some added amusement. The photos are taken using high-end photographic equipment and are then produced on a 6x4in print with a choice of payout formats. A professional sub-dye printer is used to produce the photos which means they're immediately dry and are dispensed within a matter of seconds from the booth. The photo booth can print in either colour, black and white, or sepia with your guests able to choose via the touchscreen menu. 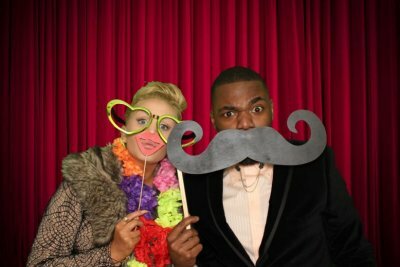 We have two different types of photo booth available: the 'Fun Booth' Photo Booth and the 'Greenscreen' Photo Booth. The white chesterfield style booth is perfect for weddings or perhaps the VW camper style booth for a more laid back reception. 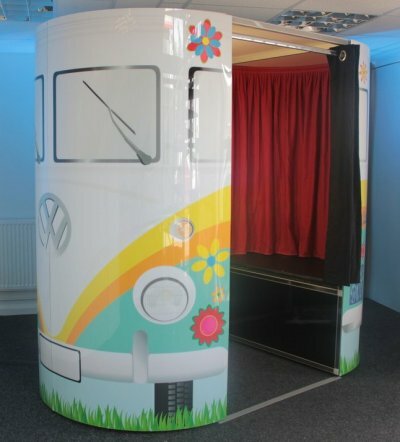 Choice of Gloss Black, White Chesterfield, or VW Camper style photo booth. Choice of Black, Purple, Silver, Pink, Cream or Red booth curtains. Unlimited photo 'sittings' during the hire period with single a 6x4in print containing the series of the four photos taken printed within seconds of the fourth photo. A CD containing digital copies of all the photos for the host of the event. This is produced and handed over at the end of the booking, you don't have to wait for it to be posted to you. 'Green Screen' option selectable from touch screen where photo background can be chosen from menu of six different themes plus the option of a digitally created curtain background. If you'd like a certain theme of background just let us know and we can probably add that for you. Our photo booths break down into parts and are transported in wheeled flightcases that will fit through a single door. 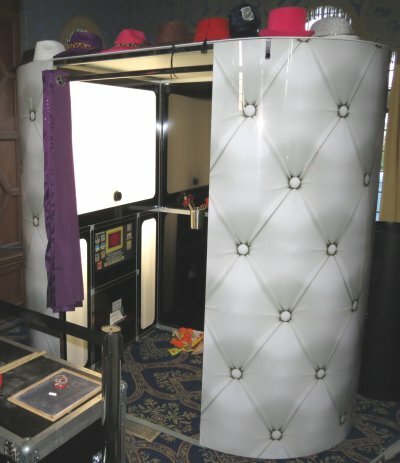 The photo booth will require an overall operating area of just 9x7ft with a height clearance of 6ft 10in. It needs to be a level area with a solid floor - we're unable to set-up on grass or carpeted grass. If the venue is not on the ground floor lift access will be required and this needs to be at least 5ft 3in deep and 2ft 6in wide. Access to a normal 240volt mains electric supply will be required for power. 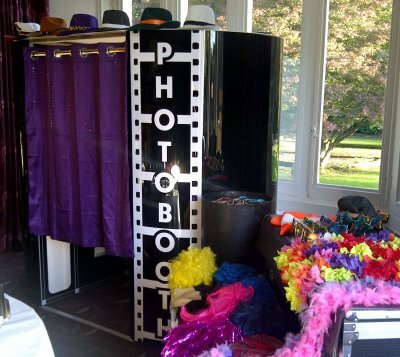 Due to the electronic equipment involved the photo booth must be used either indoors or inside a weatherproof marquee. If the event is being held during the winter months any marquee must be heated. Our staff will normally arrive an hour and a half before the agreed start to set-up but if you require it to be set up earlier than this it can be arranged subject to a surcharge.